Ingredients: PURIFIED WATER SODIUM LAURETH SULFATE (FROM COCONUT OIL) AMMONIUM LAURYL SULFATE (FROM COCONUT OIL) SODIUM CHLORIDE PEG-150 DISTEARATE CHAMOMILE EXTRACT POLYSORBATE-20 POLYQUATERNIUM-10 DISODIUM EDTA ROSEMARY EXTRACT ALLIUM SATIVUM (GARLIC) OIL FD&C YELLOW #5 FD&C BLUE #1 FRAGRANCE. 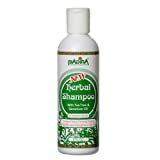 Herbal Shampoo contains natural organic herbs and botanical properties. Enriched with pure tea tree oil, Chamomile and Vitamin-E. No animal byproducts are used. Tea tree oil and Geranium oil are both anti fungal and anti inflammatory properties. A natural remedy to balance & sooth irritation & itchy scalp. This great smelling herbal formula cleans beautifies and enhances the health of all hair types.